This look like a loud and smelly place to have tea. So this illustration plays off the idea of Kansas City being a Paris of the Plains. I always thought Paris of the Plains referred to KC in its youth being a cultural hub and bustling city on the plains. Then I read it referred to the fact that KC is second only to Paris in miles of boulevards and parkways. Next I read it referred to the decadent prohibition era of Boss Tom Pendergast, when KC was a city that never slept. Well I've come to realize its all those things so it doesn't really matter. Also with all the recent Cuba hubub I heard Havana being referred to as the Paris of the Western Hemisphere it became clear that its just one of those phrases people like to throw around to classy something up. It must be good to be Paris! 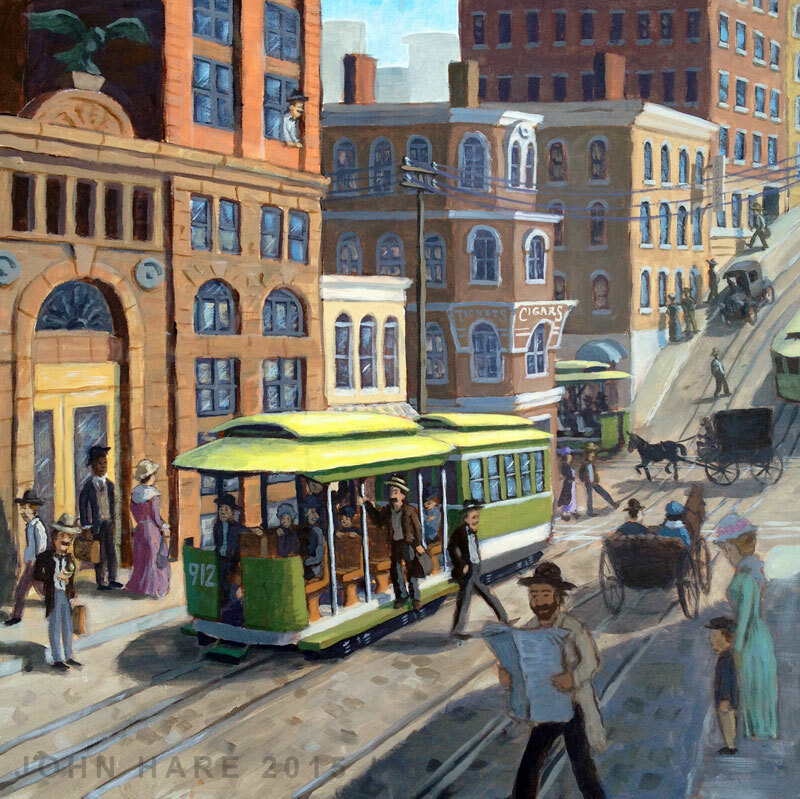 So anyways for this illustration we opted to go with a bustling downtown scene from the turn of the last century. The centerpiece is a cable car running down 9th street. I knew Kansas City had a huge network of street cars but until recently I had no idea about the cable cars! What's the difference you ask? Well, cable cars get their locomotion by gripping an always-moving cable located in a slot centered between the rails (think San Francisco trolleys). Street Cars are powered by electric motors which get their electricity from a grid of wires suspended above the road. The cable lines had a short, but extensive run here in town. In fact, at one time KC had the 3rd biggest network of cable cars in the country. Its like we were the San Francisco of the Midwest! See, I don't know about that kind of phrasing. Its like saying "Hey! You're like that other guy who does that thing better!" For the final I went with a grip car pulling a trailer. The grip car is the open car.